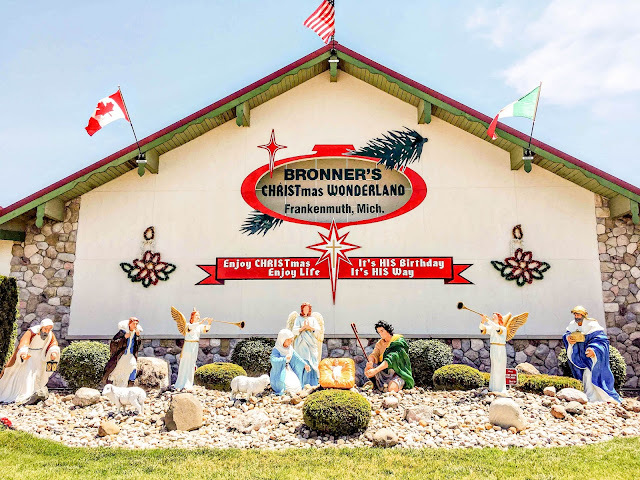 Theresa's Mixed Nuts: Christmas Fans Love Bronner's Winter Wonderland! 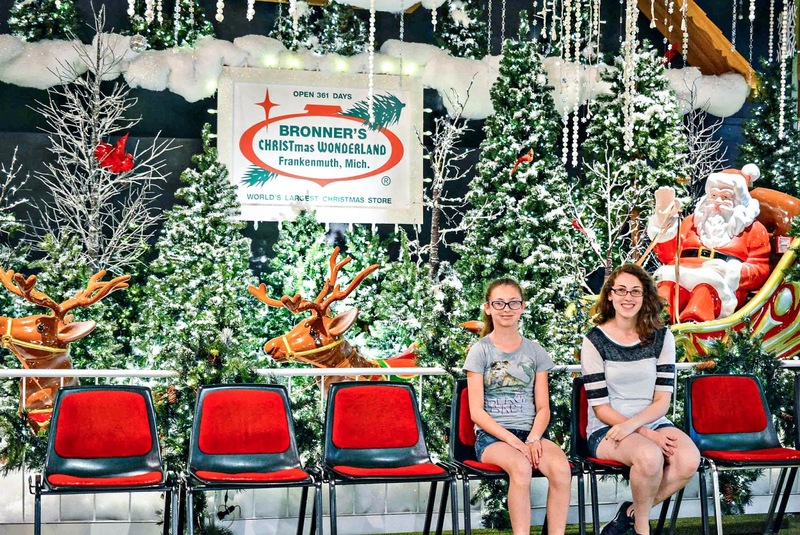 Christmas Fans Love Bronner's Winter Wonderland! For over 10 years, Jason has been itching to go to Bronner's Christmas Wonderland. If you haven't heard of it before, it's a massive (and I really mean massive!) store focusing on... you guessed it- all things Christmas. It's over 5 hours one way for us to drive, and I wasn't making a 10 hour round trip drive just for a visit, no matter how cool this store sounded. 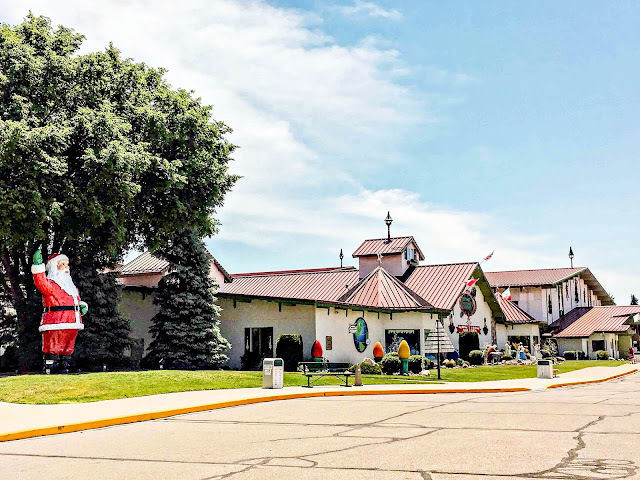 But on our drive home from Mackinac Island this summer, we were going right through Frankenmuth, Michigan. This opened up the perfect opportunity to see what the fuss was all about. Even though we visited in the dead of summer, the drive up to the building was quite magical. 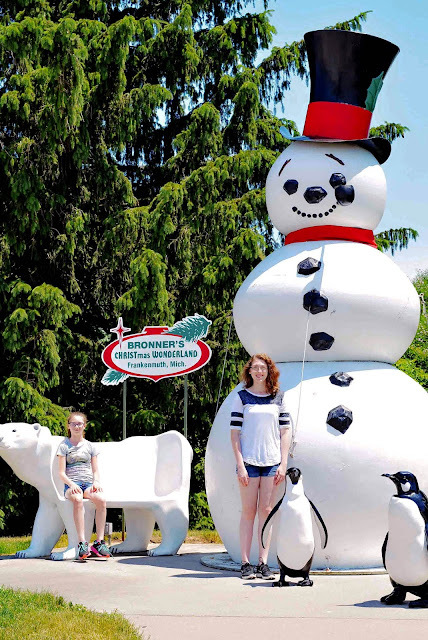 The landscaping is all Christmas themed, which made us feel like we were heading right into a holiday wonderland. 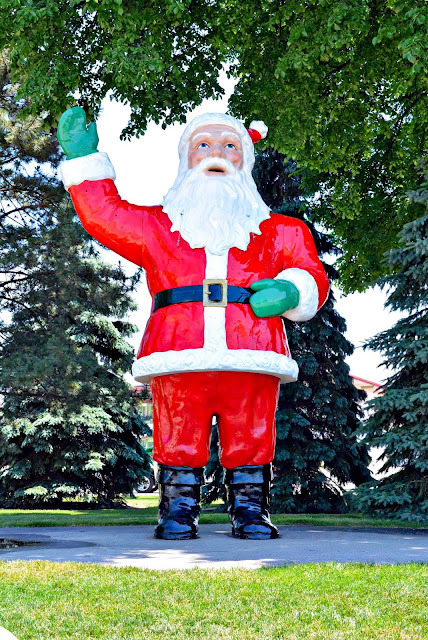 The streets are lined with fun Christmas ornaments and statues, and the poles are decorated in wreaths and bows. For a minute, we forgot that it was scorching hot that day and allowed ourselves to be sucked into the whole holiday vibe. Plus, it didn't hurt that Jason had the air conditioner blasting on ice cold. Once inside, it's a Christmas lover's dream. 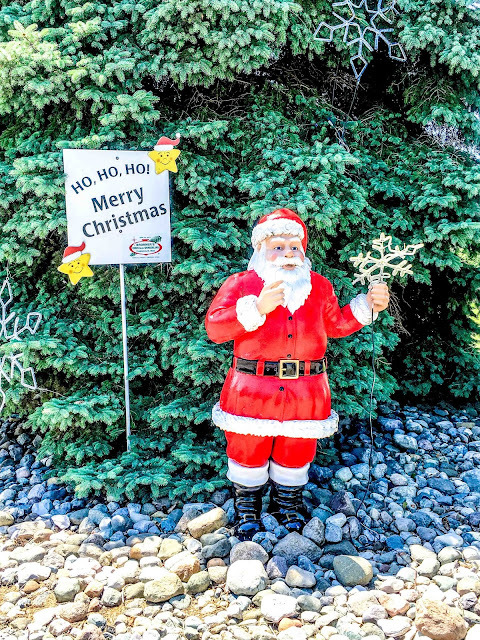 You'll find anything and everything related to Christmas here. Ornaments, trees, stockings, figurines... you name it, they have it. While most of the store is Christmas oriented, my Halloween loving heart was immediately drawn to their Halloween section. You can also find a few other holidays featured in Bronner's, like Easter and Thanksgiving. The store is so huge, there's even a little dining area so you can refuel for some more power shopping. I love how they don't miss a beat, making sure every touch of the store is holiday themed. 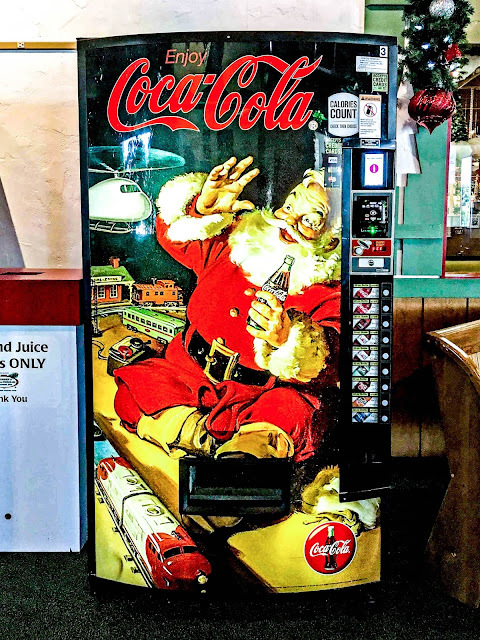 Even the Coke machine is Santa! 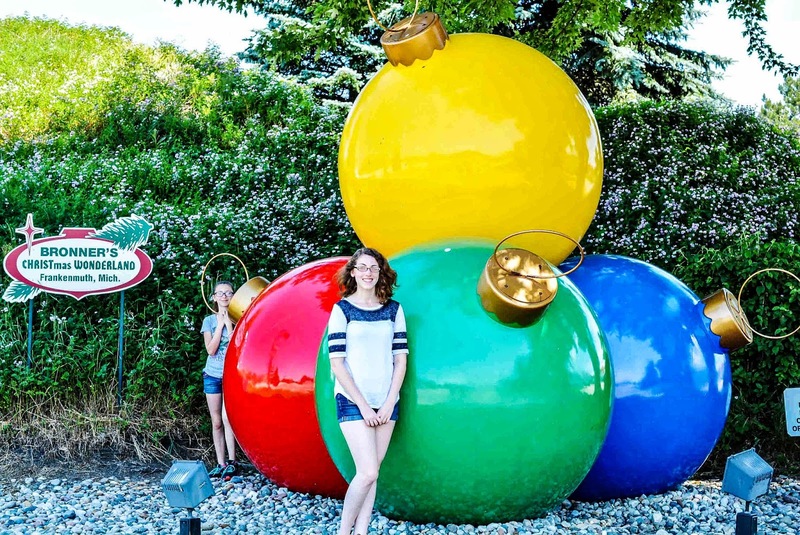 There are lots of places to stop for fun photo opps too! Be sure to grab a few snaps with the oversized holiday statues on your way out! 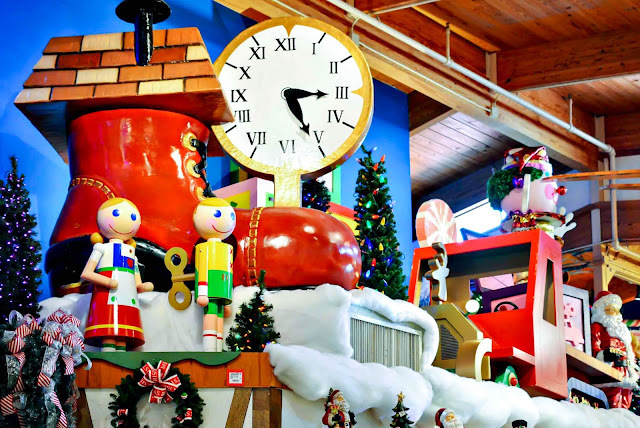 What holiday items would you shop for at Bronner's Christmas Wonderland? This is amazing! It truly is a Wonderland!! I would probably shop for fun ornamants and candy! Wow, they sure go above and beyond there. Can you imagine having a statue that huge in your yard? 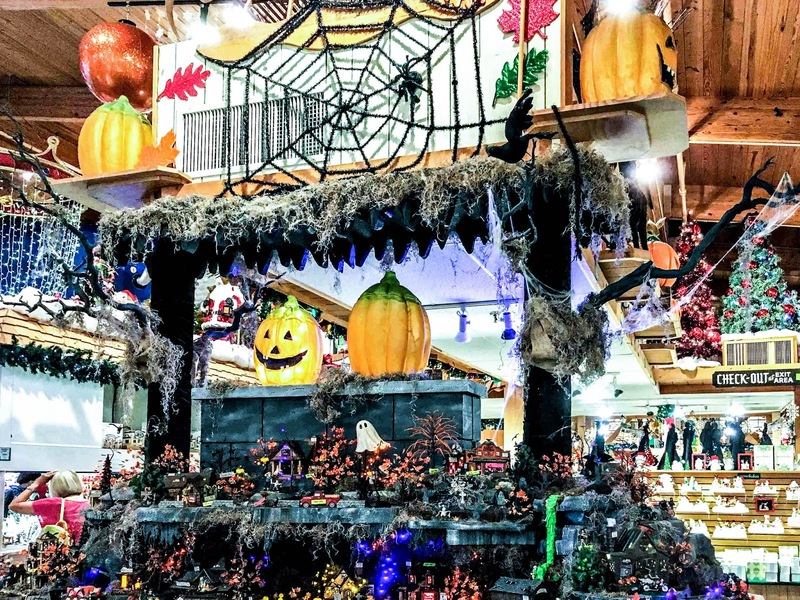 Smirked as I saw the Halloween section, hippie heaven for you. 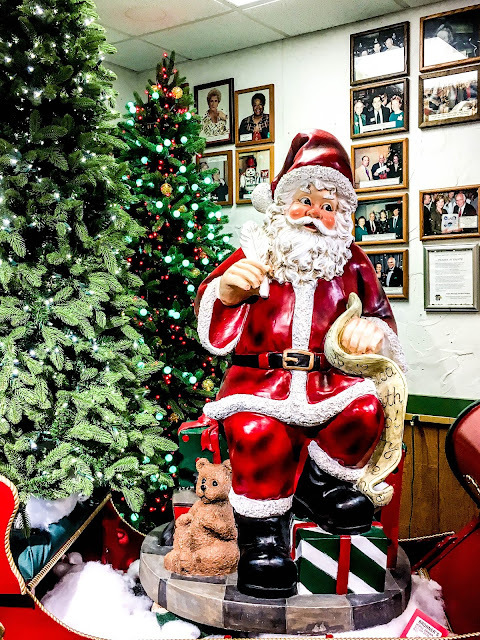 I would've deemed it a strange itch to have if I did not know Jason's love for all things Christmas :) Such a lovely place to visit, my eyes would probably pop out and melt there! I always miss this festive fever that we never seem to have over here, or maybe I just never notice it due to too much work. Time to slow down for a few days and enjoy the holiday Dezzy! I've cleared my schedule for the next week so I can just relax and do what I want to for a change. Wouldn't that bench be so delightful to have? I'd need a few of those penguins too though. You can never have too many critter statues, can you? can't slow down, got a massive 16 pound heavy art encyclopaedia to translate till New Year's Eve! Admittedly, just one part of it, but still.... they better have my money, though! It didn't hit me until I saw the sign, but I have an ornament from there - my inlaws bought it for us when they were in that area years ago - had to have been either 2003 or 2005, because it's a baby's first Christmas ornament and that's when my kiddos were born. It's still in the original box, and it has the same white background with BRONNER'S on it. I would LOVE to go there - seems like a fun place to visit. That is so cool! I am sure that's a treasured ornament! If you ever find your way up north, and are passing through the area, definitely stop. I overheard one man say he goes there once a season to shop. Seemed a bit excessive to me, since one visit was enough for us, but it really is a must visit if you are close enough. I've ordered from their website, but I have always wanted to visit their store. It looks amazing. I don't know why I never thought of ordering from the website before we made the trip. They do have a lot of cool stuff to buy! That looks like so much fun! I love all the ornaments and decorations. It's a Christmas bonanza! 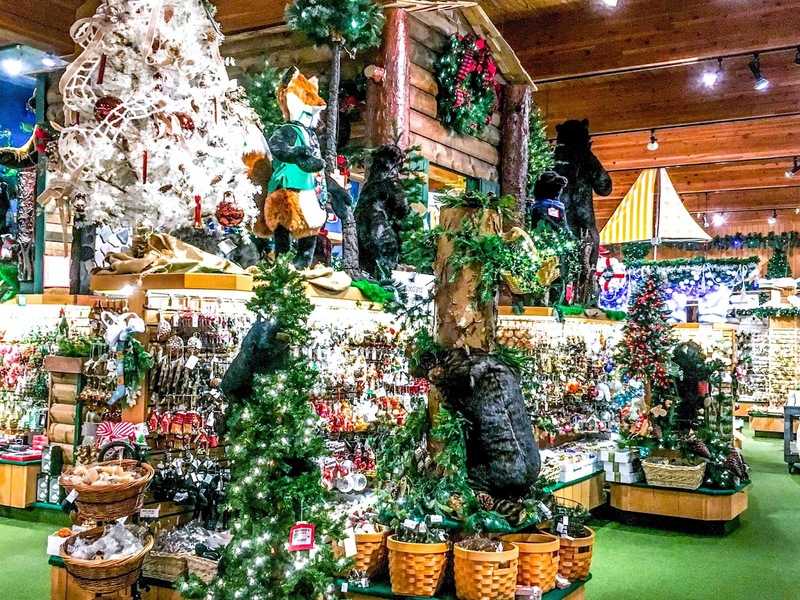 Bronner's looks great. They have SO. MUCH. STUFF. 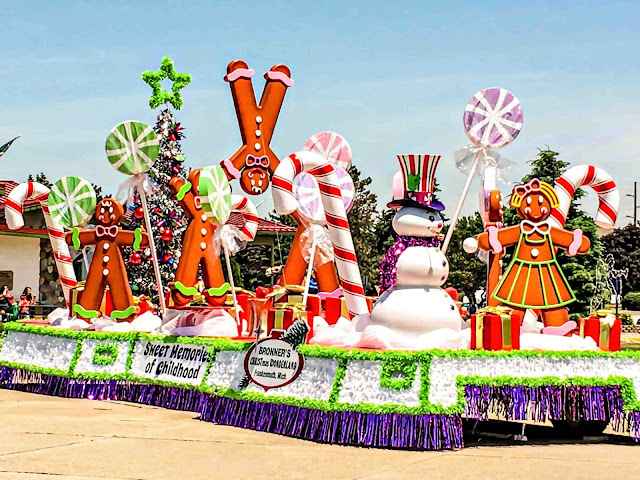 I would love to visit and grab up a bunch of ornaments and decorations. Looks like a great place, so merry and jolly. Love to see those holiday decorations and accents, Theresa..
Bronner's looks like so much fun to visit. I love finding places like this to see during the holidays. It does look like one amazing place to visit! I would definitely love to take the family there! What a fun place for the entire family. I love all the gigantic decorations that make a perfect backdrop for pictures. I don't really support places like that that try to usurp Christmas as something just for Christians. Modern day "Christmas" is really just a morphing of winter festivals from all over Europe when they land was still pagan. Too bad unlike Easter, it's not named after a pagan deity. The start of winter is the reason for the season. Literally. SO JEALOUS! I have always wanted to go here!!! This is really fun!! Such an amazing place to spend the holidays! 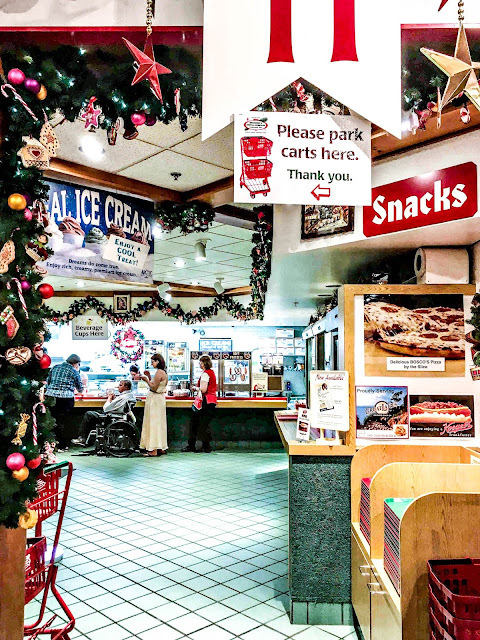 This looks like a fresh place to get in the mood for Christmas. It is so cheerful looking - your pictures are so bright and awesome. This winter wonderful looks like so much fun! I wish we lived closer! So many Santas! I bet the kids would love a shopping trip there. Can't have enough ornaments! Wow... what a fun place and a great idea to go there every year for a family tradition. Find an ornament each year for the kids. Wow! This place is a Christmas lover's paradise! My kids would havve a blast exploring every inch of it!